I pulled out a good bottle for this one, the Ardbeg Corryvreckan, a perfectly mounted Single Malt from Islay. I have even loaded up my current iTunes playlist and stuck it on shuffle. What is the best thing about both of these beauties? I know exactly what I am going to get: Quality. 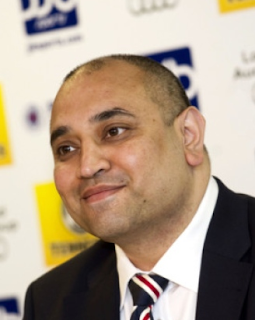 Upon hearing claims that the disgraced former Commercial Director of Rangers Imran Ahmad planned to release details of a purported £67M worth of deals he had secured I hoped that I was going to get the same thing, quality. Not unexpectedly, Imran, through utterances from Bill McMurdo failed to deliver. In an attempt to rationalize his £3.4M claim against Rangers he has once again shown himself up as nothing more than a Mr. Wormwood. Similar to the character from Dahl’s wonderful yarn; through unscrupulous business practices Imran also looks to reap great profits from disguised, repainted arguments. Lets be honest for a minute: Craig Whyte’s money could have accidentally ended up in a foreign account (that is geographically speaking, not some Chuck-like casual xenophobia, just in case we were getting sensitive). Imran might never have been a poster on Rangers Media. Furthermore, with his suing Rangers for £3.4M he might just look to return that full amount plus an extra £500K in to the Club's coffers. I mean, it makes perfect sense to sue a company you are a shareholder of with the sole aim of returning any monies awarded back to the company you just sued. Because, you know, principle annat, innit? Damn, The Corryvreckan. What a whisky. It stings on the finish in that coriander type of way. But, at the heart it is all sweetness and light... 'The Modern Leper' by Frightened Rabbit just came on. “And you are back for even more of exactly the same.” Serendipitous from the lads hailing from Selkirk. With that, lets have a look at Imran’s response in a little more detail. Sports Direct Puma is a 5 year contract and should produce profits of £4m per year for the next 5 years. Is this a deal with Sports Direct or is it a deal with Puma? When I sat in Brian Stockbridge’s office in October of 2012 he told me that ‘we’ were negotiating with three parties: Adidas, Warrior and Puma. At that point I offered my considered opinion that the best deal for the Club was Puma. Adidas did not represent enough of a return per unit sale and Warrior did not have the brand equity to appease the Rangers support. The Sports Direct deal was a completely different entity. Is it now one and the same? On to the point of ‘we,’ did Imran negotiate this deal himself, in isolation? If not, then surely he would be only due a percentage commensurate with his input on said deal? Fairness, Imran. Principle, you know? So, this £4M per year… I think we can put that down to approximately £850K/year less than what the much-maligned JJB deal was yielding? £18M up front and guaranteed £3M per year with initial payment of £3.5M, and over a ten year period. That yields £4.85M per year on average. Given that Imran uses the supposition of ‘should yield’ I think it is only fair I am afforded the liberty of averaging the yield of the monstrosity that was the JJB deal, you know, the deal we were told this new arrangement would be a massive improvement upon. That’s £20m of benefit to Rangers I have directly negotiated on Puma. Yes, Imran, you are directly responsible for negotiating a shirt deal on behalf of Rangers FC. Because without you no kit maker worth their salt would want to look at a club that took approximately 200,000 supporters to Manchester in the biggest movement of people inside the U.K. since World War II. It must have taken some keen negotiating skills to get someone to the table that would suffer such a brutal situation. No. Sorry. This was a simple game of profit delivery: What brand wanted Rangers in their stable and how much they were willing to pay for it? Offset that with what brand that Rangers wanted to go with to ensure maximum uptake from the Rangers support and, hey! Presto! We have a deal. Gecko you isn’t. £12.5m pre-IPO cash I directly negotiated and introduced. You know what? If this is accurate (forgive my skepticism) then well done. Exceptional work. As I have said many times with respects to fund raising, and with specific regards to December’s IPO, to raise that amount of money in a triple dip recession while the European economy fell apart? Incredible. However, does that then mean we have squandered almost ~£46.5M in under ten months? This supposed £12.5M in pre IPO money (Cash, right? ), ~£12M in season book and hospitality money and last but not least the £22M in IPO money. That is some serious spending. Was the entire wad required to push the Dallas Cowboys deal through? Or was it set in escrow to set up the US soccer schools? One last question on this particular item: What exactly did you have to promise to secure this funding? I don’t want to look a gift horse in the mouth and £12.5M sounds great but if it cost us £20M in equity or something equally ludicrous? That wouldn’t be so astute. £23m of IPO Cash I negotiated via Cenkos. That money is gone Imran. Did you not see Brian’s bit in The Sun? It was itemized. In fact, the purchase price of Edmiston House didn't quite stack up to what you said. I was sure you would have been keen to keep up on current affairs. But hang on a second. Haud the bus! Were you not quoted on Bill’s blog as saying, “I am hardly going to turn my back on a bonus which is due to me when I’ve directly negotiated £67m worth of contracts which benefit the club over the next 5-10 years”? That reads to me as if you are talking about future deals, not money that has been squandered inside of nine months. And by a Board that you had direct influence over. I guess the 2.2M shares with a current valuation of ~£934K (that you reportedly paid £22K for) was not bonus enough? Guess what though: You don't have to turn your back on that bonus. That is coming to you and well you know it. It comes in at just under 43-times your initial investment. Decent return for a years work. By buying Albion Car park I saved the club £3.5m over 10 years as lease was an astronomical 350k per year. Buying the Albion Car Park should have been at the forefront of any Commercial Plan serious about the acquisition of Rangers. So, what are you going to do with that £3.5M asset that you bought? Casino? Or, wait, what was it that you and Charles said in Toronto last year… Medical research facilities? Here is where my concern lies with the purchase of the Albion Car Park: As much as it was a desirable asset, was it going anywhere? Was it going to dramatically increase in value such that the club might not have been able to purchase it at a later date for just about the same price? Given that the Club has no credit facility and is currently in the position of receiving negligible television revenue (thanks for ‘standing up for us’ though King Chuck and Good Guy Imran) was this really necessary? It screams of Commercial shortsightedness. Worrying for the Club’s one time Commercial Director and close pal of its current consultant, Mr Green. On Azure I got them to cough up another £7m over existing contract. They just gave that to us? Given that I am a gnarled out commercial guy I would like to know exactly why they decided to give us an extra £7M over the course of the existing contract. Could it be because we had the ‘right’ to walk upon immediate formation of the NewCo? Over a reported nine-year contract and given the fact that Craig Whyte had mortgaged future revenue with Azure and financing firm Close Brothers... I will ask you, the Rangers supporter reading this, is this worthy of a bonus? Once again I would suggest that there were a number of deals on the table and the best one was chosen given the myriad of demand from the Ibrox punter, quality of product and margin yield to the Club. Now I have a jar full of straws on my office desk that need clutching at. Must finish this whisky, ehm, piece for The CRO. Bought Edmiston House for £1.5m which when developed will bring £2m per year into club. Once again, we are looking at a two fold situation, neither of which is particularly astute. First we have a deal that might bring in a reputed £2M per year to the Club. Can I ask where the rationale is for this? Was there research done to establish how much a museum or restaurant facility might realize in the way of turnover (or more importantly, profit) to the Club? Lets look at the situation where we have a museum. If the average museum punter spends £10 per visit, then we are looking at just shy of 4000 visitors per week, per year. Or 600 people through the door every day. Govan must be booming since I last visited. How about a restaurant/café? Open for corporate functions every time Rangers play. Average corporate event spend (at a reasonable estimate) £2K per group/event. That gives us approximately 20 incremental corporate clients, 52 weeks per year. A bit ludicrous given that we don't sell out corporate hospitality at Ibrox Stadium now. That being said, there may well be an ingenious plan to lure in the corporate client. Maybe Paul Stretford or Mike Ashley could wine and dine some of the people they have influence over at Edmiston House? No? What about Neil Warnock? He likes a good game of kick-baw. Tell you what is the best thing about the Glenmo 18 – the red fruit on the nose. It is so deliberate and obvious. You would never doubt that red fruit–strawberry, raspberry and cherry–every time you stick your bugle in to a glass. My 5% bonus is only based on cash profit into club. In essence what Imran Ahmad is saying here is that he is only suing us on profit realized by the club. Except, that profit is highly speculative and has yet to be demonstrated on any level. Quite simply put, you cannot claim a bonus on a perceived profit. This is like blowing up to The Lottery counter at Tesco and saying, "I know the numbers, gie me the cash" on the Friday evening before Saturday’s draw. This is not to say that he does not have claim to a bonus on any such profits. That will and should be determined through the appropriate legal channels. But, equally as true, is that if this was a serious claim he would have to wait until at least a portion of these profits were realized. Namely, when Rangers started seeing a benefit from them on the company Profit and Loss statement. Of course, when you breach a contract due to gross misconduct it may disqualify you from entitlements. Such as “5% of all cash or any savings he/she brings into the Club”. I am sure that both Newcastle and Arsenal would agree. 'Wake Up' by Arcade Fire. Given the nonsense that has gone on between us all recently I don’t think I need to tell you what the priority should be after reading this. But, for posterity’s sake, this is your Club. Our Club. Once again, rich men have taken control of it. They have taken deliberate and decisive action to make sure that they get richer from it. Hell mend them. And, hell mend us if we find it more important to fight each other over a well-intentioned, misguided, disingenuous or unimportant position rather than directing that energy at those that seek to destroy Her. Put up or shut up time, is it Charles? Who kept the lights on at Ibrox?